Etlinger is not a common plant, but if you've ever seen one in bloom, you likely remember it. They grow like typical Alpinia gingers, with canes that rise from the ground and flat lance-shaped leaves on the top of the cane, standing upright. Depending on the species, these can be fairly large plants, and like other gingers, they are aggressive growers. Their flowers are remarkable—they feature the same waxy bracts typical to other gingers, but these flowers emerge from the roots on shorter stalks that cluster around the feet of the larger leaf canes. Although there is a wide variety of species, the one you're most likely to see features red flower bracts with white and yellow accents. These are not particularly easy plants to grow; you need to be equipped to handle truly tropical plants, with no hint of cold drafts or dry air. But if you have such an environment, and room enough for a decent-sized container, these will be a remarkable addition to your collection. Light: They prefer dappled light or morning sunlight indoors. These are margin and understory plants in their native tropical Asia but may require somewhat stronger light indoors. Water: They are water lovers and need to be kept continuously wet. This doesn't mean standing water, but they can handle fairly water-logged soil and will continue to thrive. Provide good drainage, however, to prevent root rot. Because these are so hard to find in cultivation, you'll likely need to continue propagating any specimen you're lucky enough to find. Propagation can be accomplished through seed (typically purchased) or through root division. Root division is fairly uncomplicated. Divide a viable piece of root with at least three growing nodes if possible and place into its own pot. Water consistently and lightly until new growth starts to emerge. Root divisions need consistent warmth. Careful repotting will be necessary to keep your specimen healthy. Plants should be repotted annually or every other year, depending on how fast they're growing. They spread by a rhizomatous root system, so a plant that's ready to be repotted will easily emerge from its container. Divide the root ball during repotting to end with two plants and remove any dead or brown root sections. Repot into fresh, rich potting media and feed the newly repotted plant with a controlled-release fertilizer. There are about 50 species of Etlingera throughout tropical Asia. Like many types of genus, there is some confusion over their naming. These plants are also known by the genus Nicolaia and Phaeomeria, neither of which are properly used anymore. However, the plants are still found with these labels. All but one species of Etlingera are very rare, to the point of impossible to find. The only species you're likely to find in cultivation is E. elatior (also Nicolaia elatior and Phaeomeria magnifica). This plant can grow up to 18 feet in the wild, but you can successfully grow in a larger container. It has red, waxy flower bracts. The trick to growing these plants is to emulate as closely as possible the tropics. This means plenty of water, heat, and humidity, with strong but not direct sunlight. If your plant starts to develop brown leaf margins, it probably isn't getting enough water or the humidity is too low. If the plant won't bloom, despite healthy leaf growth, the issue is most likely a lack of light. 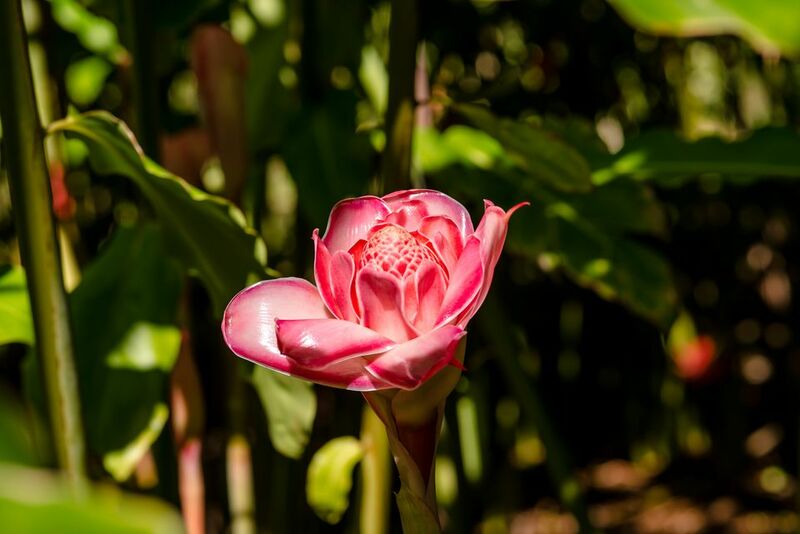 Etlingera is vulnerable to pests including aphids, mealy bugs, scale, and whitefly. If possible, identify the infestation as early as possible and treat with the least toxic option.